On Luang Prabang’s market I came across this lady selling fresh spring rolls – $ 1 for 5 – and became a regular for the time I spent there. They came to be my everyday lunch because they were just so delicious. Fresh, crisp and oh-so-scrumptious. Back home I searched for a recipe but none tasted just right – until I came across this one. It even included the dipping sauce and the vegan version is just as tasty as the original (including fish sauce). 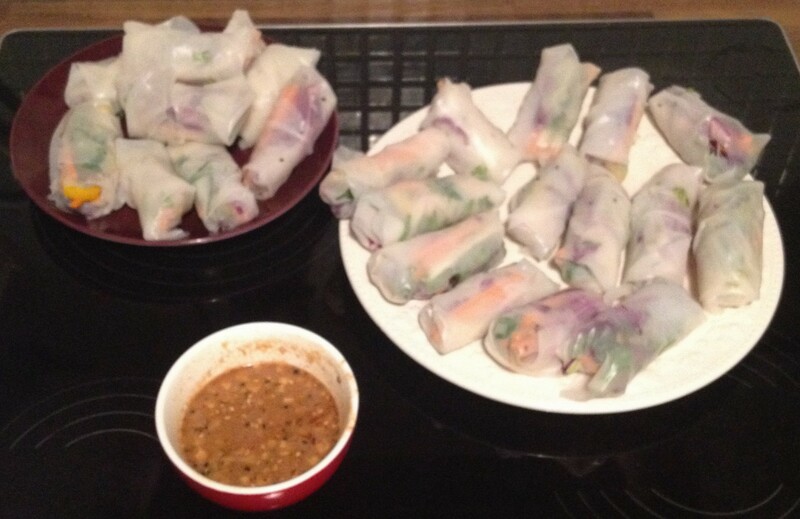 The basic ingredients are rice paper (for the actual roll), fresh mint and coriander and glass noodles. Starting with those, feel free to add, substitute or leave out whatever doesn’t appeal to your palate. Get creative, have fun and enjoy the result! Boil water and let noodles soak for 3 minutes, then drain them. Wash all other ingredients for the rolls, drain them, then put them in separate bowls and arrange them plus a plate of very warm water. 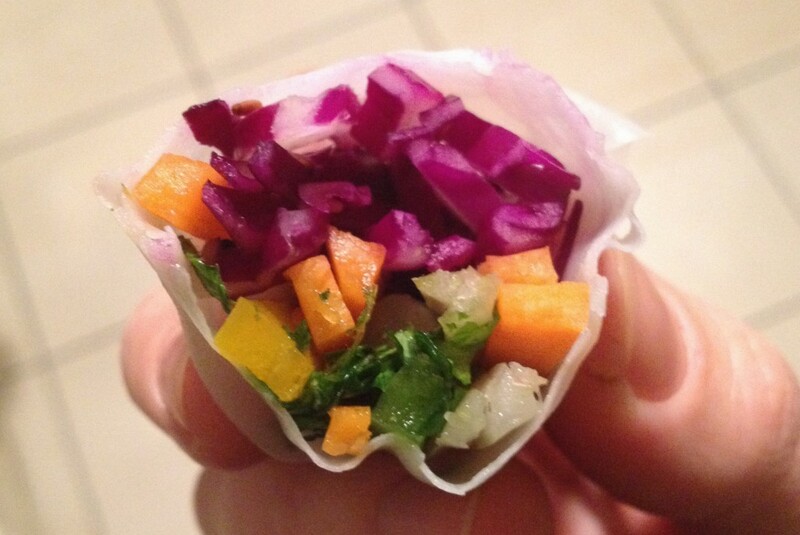 Dip one sheet of rice paper in the warm water for a few seconds, hold up to let the excess water drip out. Place it on a flat large plate and wait for a minute to allow the paper to get soft. 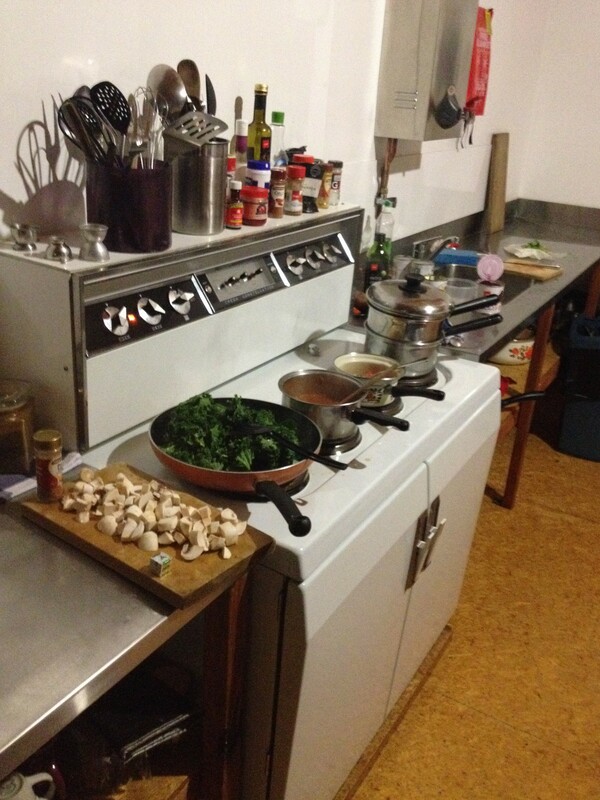 On the end near you, place a little bit of everything (approx. 2 TS of noodles, 4 pieces lettuce, a couple of bean sprouts, 5 cilantro leaves, and 3 mint leaves). Fold over the end near you, roll over once, fold 2 sides toward each other, hold it tight, and roll over toward the other end. If the water gets cool, replace it. 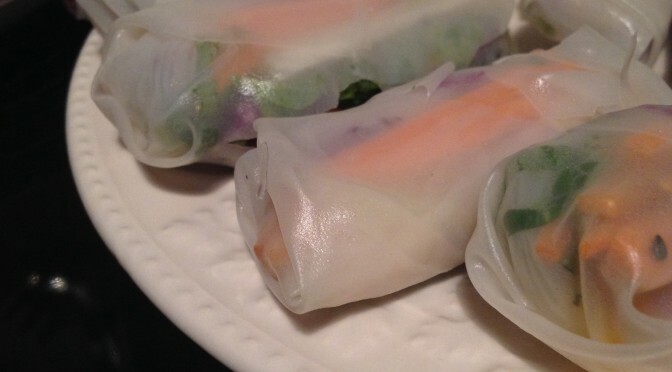 Also, after a few rolls you will be able to use two plates – while you finish one roll, the rice paper for the next roll is waiting. For the dipping sauce caramelise the sugar on medium heat until it turns golden brown. Cautiously add 1 cup hot water (be careful as it will boil vigorously!) and keep boiling until the sugar dissolves (cover with a lid for faster results) and let it cool for 30 minutes. Transfer the sauce to a blender and add salt, garlic, peanut butter, lime juice, and pepper; blend for 30 seconds. For extra flavor you can add roasted peanuts: place peanuts in a frying pan on high heat, shake and stir constantly 3 minutes then cool for 15 minutes and carsely grind the roasted peanuts. Now take a roll, dip it into the sauce and enjoy the taste explosion that’s suddenly going on in your mouth. 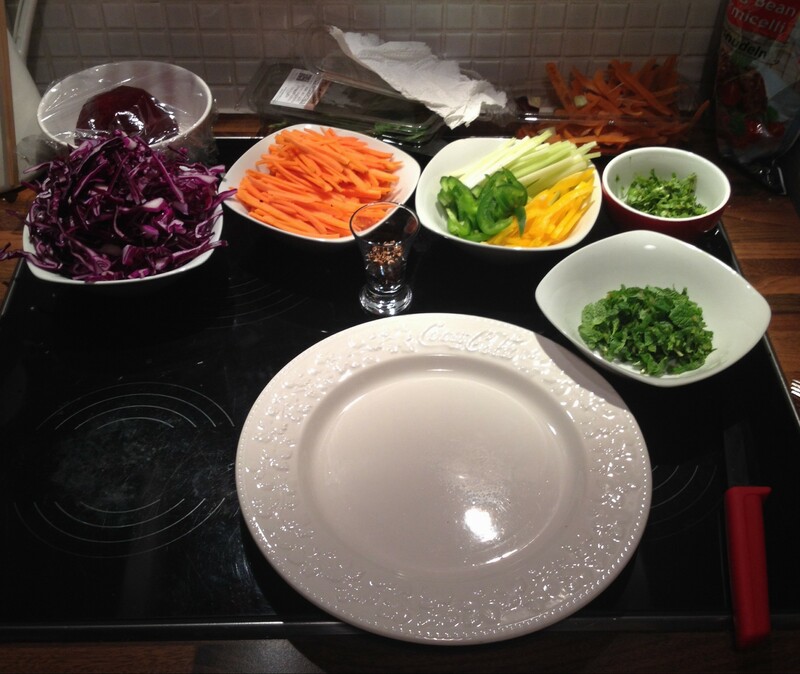 Of course you can use different kinds of vegetables – like I did here -, such as red or Chinese cabbage, celery, capsicum and onions in your rolls. Find out what you like best and keep improving your version of this dish. You can buy the more exotic ingredients at Asian supermarkets but also most bigger regular supermarkets will now stock them. 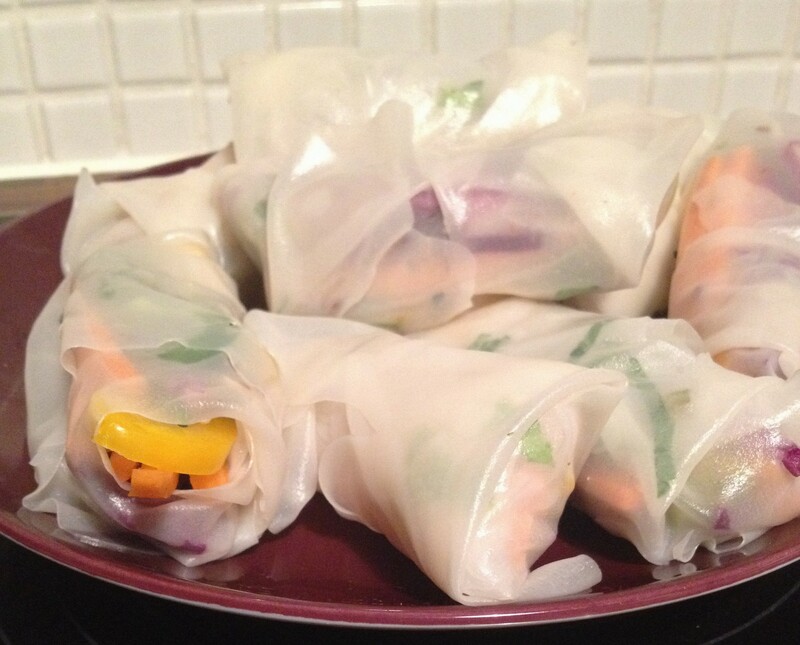 My version of summer rolls contains also a couple of Thai Basil leaves which make the rolls Vietnamese style. Bon Appétit!